Analog Artist Digital World: Purple Pride immediately siezes Orlando. I was going to Falcon Bar (819 E Washington St, Orlando, FL) or Mystery Sketch Theater which has a cos-play model taking poses for artists once a month. Streets were blocked off and I found myself walking besides runners in a 5K race. Everyone was wearing purple tee shirts. I heard an announcer and walked towards the noise. A finish line was set up on the East side of Lake Eola Park on Washington Street. A Food Truck Bazaar were set up beyond the finish line and hungry runners lined up for food. 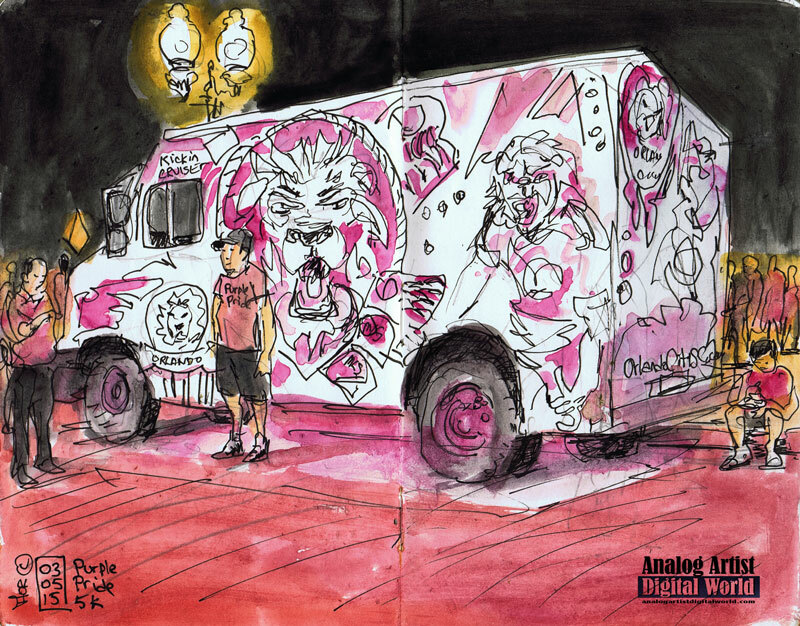 I sketched the purple Orlando Soccer truck. Soccer has been promoted with a vengeance and Orlando City Soccer Club logos, murals and stickers are all over town. Lion heads appear everywhere. The renovated Orlando Citrus Bowl Stadium is now packed for every game. I haven't figured out who to contact yet about sketching a game. I feel I need to report on a team that has quickly become as known as the Orlando Magic basketball team. With the US team doing better in the international soccer competitions, the fan base keeps growing. Mark Baratelli of the Daily City had organized all the food trucks. He showed me a paper that he now publishes that shows where to find each food truck bazaar all around Central Florida. I admire the marketing prowess of the Orlando City Soccer Club and Mark's entrepreneurial spirit. After I finished my sketch I walked over to the Falcon Bar to squeeze a few more sketches into my day.